Uncharted 4: A Thief's End trophies list is already available. The total amount of trophies is 56 (1 - Platinum, 6 - Silver, 32 - Bronze and 17 - Hidden). You can see the full list below! Complete the game in explorer mode. Complete the game in light mode. Complete the game in moderate mode. Complete the game in crushing mode. Complete the game in 6 hours or less. Defeat 50 enemies with headshots. Perform 20 headshots from the rope. Perform 30 vertical stealth takedowns. Defeat 50 enemies from-the-hip or blind-firing. Defeat 10 enemies in a row, alternating gunplay and hand-to-hand. Defeat 100 enemies in a row without dying in combat. Complete game with 70% or higher shot accuracy. Defeat enemies with a pistol, machine gun, and grenade, in that order in 15 seconds. Get through Scotland cemetery combat encounter without killing or being seen. Make 10 enemies drop their grenades. Defeat 4 enemies with the same explosion (all explosive items and weapons are allowed). Defeat 10 enemies in 60 seconds with the China Lake Grenade Launcher. Destroy 10 vehicles while being dragged from the rope. Defeat enemies with a stealth attack, melee attack, headshot, and explosives, in that order, in 15 seconds. Defeat 5 armored enemies with melee only. Perform 10 combo buddy takedowns. Pull 20 enemies over when hanging from a ledge. 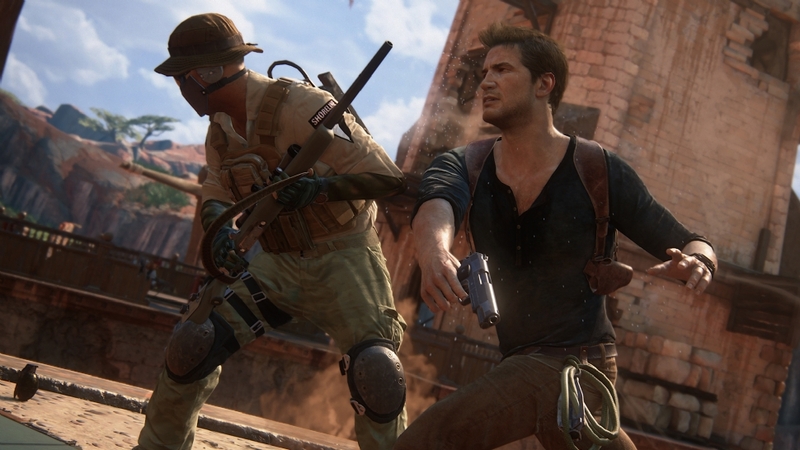 Complete the Uncharted Multiplayer Introduction. Complete 5 matches in Multiplayer. Complete all trials on Moderate (difficulty) in Multiplayer. Spawn 10 Sidekicks in Multiplayer. Revive 10 Allies in Multiplayer. After being marooned, leave everyone alive until the Treasury. Play with the lemur in the market and let it steal your apple. Knock over all rock cairns in Madagascar. Climb to the very top of the Clocktower in the City. Solve the first Trial in Scotland in 10 moves or less. Beat the best score in the retro videogame. Listen to all optional conversations in game. Play in the ocean near the sunken ship. Just prior to City Chase, stand perfectly still for 30 seconds (stage demo fail). Drive away in the jeep with Elena without killing any enemies. Get three dolphins to follow the boat. Hit all targets in the attic with the toy gun. Take a photo of Sully. Perfectly parry Rafe in the sword fight without getting slashed or stabbed.